Early in the morning of May 14th 2005 Ferknerkle lost a great supporter – director and producer MICHAEL CARSON – to pancreatic cancer. One of Australia’s most innovative and respected artists Michael’s resume stretches back to the early 70s when he began work at the ABC Studios. His first forays into directing included the groundbreaking pop music programme GTK – a collection of live performances and interviews with cutting edge bands and performers of the halcyon days of rock music. 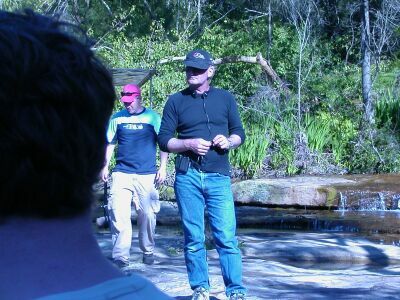 Michael’s life-long passion for quality drama, and respect for both writers and actors, quickly carried him into the forefront of Australian TV drama. After a string of challenging, and successful, directing assignments Michael created and produced the confronting, and timely, ABC mini-series Scales Of Justice – a no-holds-barred exploration of police corruption that spared no-one in its journey up the food chain from lowly constable to the minister of police. Screened a month after his death at a special session of the Sydney Film Festival, Episode One of Scales (The Job) still possessed the power to confront an audience even 21 years after its first broadcast. Michael was also instrumental in other milestone ABC series including Phoenix, Janus, Police Rescue and Sea Change. His work for commercial networks included the mini-series Jackaroo, telemovies The Bite and Devil Game, the American adventures series Lost World, and the children’s series Cyber Girl and Horace And Tina. His association with Ferknerkle began in 1998, early in its Greek Street Theatre days. From that point on Michael was a fervent supporter and helped out on several occasions, including opening up his own home as locations for some of our short films. In 2001 Michael, who had never acted (but had clearly picked up a few pointers from the many wonderful actors he directed over the years) was invited to appear in our production of Jean Dixon’s play Bad Blood. Michael occasionally wondered what the hell he had gotten himself into but, in yet another example of his courage and faith, he committed completely to his first stage role and gave a polished performance on the nights. At his farewell service at the Sydney Theatre on May 20th Colin Friels, Sigrid Thornton, Andy Anderson, Bill Hughes, Bruce Best and his closest family members spoke lovingly, and with considerable humour, about Michael’s life and work. What seemed like hundreds of us then raised our glasses at the wake held in his home at Castlecrag. I know I speak for everyone at Ferknerkle when I say that Michael will be sorely missed, by his friends, family and industry and we wish him every comfort in whatever world he has moved on to. We also extend our sympathies to his partner, Ferknerkle member Jacqui Delmege, to his son Simon, brother Tony and many friends and family members. P.S. Having re-read my eulogy I realize that I failed to describe my own feelings about losing Michael. As composing the notice took place so soon after the funeral I was obviously still having trouble coming to terms with it all. But, for the record ... Although I only knew him for six and a half years Michael and I became very close. We began our real friendship by working together on the 2000 NIDA screen acting programme and became something of a double act there in 2001, 2002 and 2003. As our working relationship progressed so did the personal and I often stayed over with Michael and Jakki and enjoyed many meals, and glasses of red, with them. The second bedroom eventually became known as The Bullock's (Michael's nickname for me - Mallee Bull) room - in spite of the fact that Ryan actually lived in it for a time. I was devastated when Michael was diagnosed as terminal and in an even worse state when he died. In fact, it took me several months to get over losing him and I still think of him most days. Fortunately, I managed to let him know how much he meant to me while he was still alive and I quote - "you're the big brother I never had, and the best friend I always wanted". I know he'll stay with me now forever and I look forward to meeting up with him in that great green room in the sky.